Tip to the Wichita Eagle editorial board: When a lobbying group feeds you statistics, try to learn what they really mean. When investigating the claims of a lobbying group, Kansas Policy Institute found that the statistics — when examined closely — do not support the narrative the group promotes. Unfortunately, the Wichita Eagle editorial board did not examine the group’s claims closely enough to determine their validity. Kansas Construction Employment, 12-Month Moving Average. Click for larger. Trabert is referring to the Wichita Eagle editorial board citing figures from a self-interested lobbying group — in this case, Bob Totten, executive vice president of the Kansas Contractors Association — without investigating the true nature of the figures. I’ve taken the same numbers from the Bureau of Labor Statistics. Because these values are available only in not seasonally adjusted form, I’ve created a chart using the moving average of the past 12 months. A second chart shows the change from the same month of the previous year. The charts confirm what KPI found, which is employment in the “Heavy and Civil” category is not responsible for the decline in Kansas construction jobs. In fact, employment in this category is on an upward trend over the past 18 months. It is employment in the category “Specialty Trade” that has fallen. This isn’t related to highway construction. This data is available in an interactive visualization which you may access here. 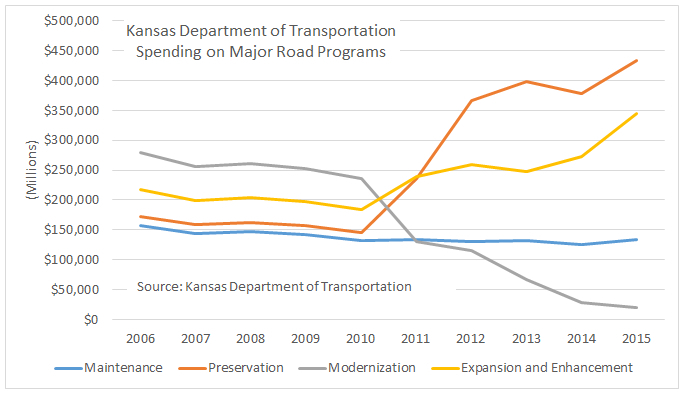 For more information on highway spending in Kansas, see Kansas highway spending. 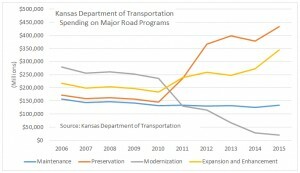 Kansas Construction Employment, Change From Year Before. Click for larger. Even if the claims were true why is it the responsibility of taxpayers to employ construction workers?